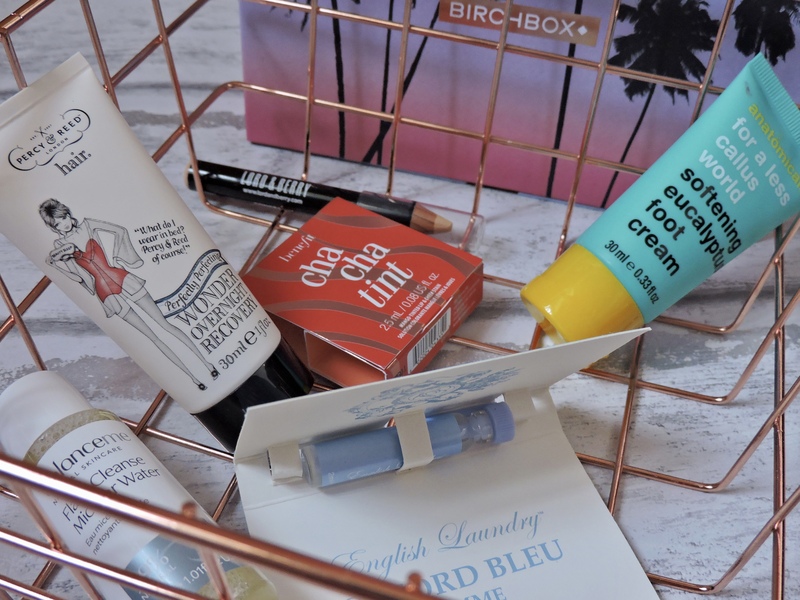 This months Birchbox couldn’t have been any more summery. The box was beautiful and the products inside were amazing! 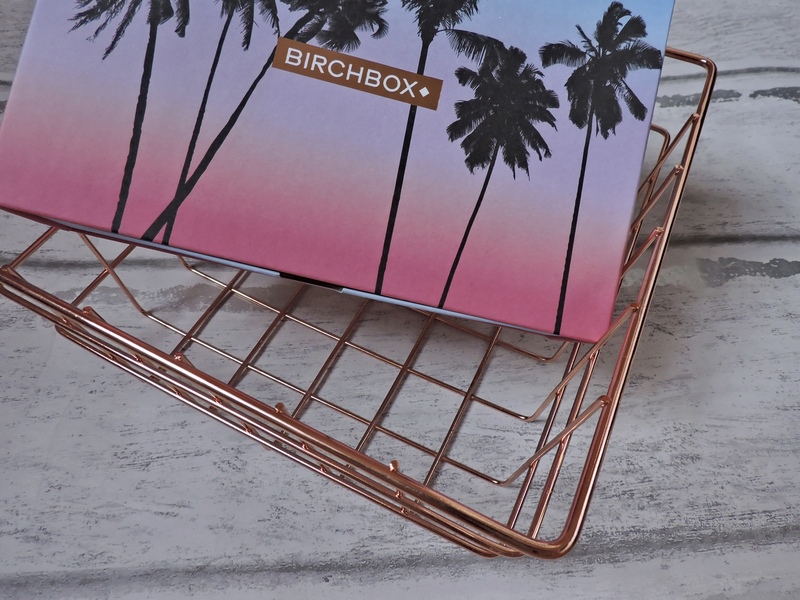 I love the print of the palm trees on the box, it literally makes me want to take a road trip to L.A or something. The ombre from light blue to pink is stunning and adds such a great effect. I was a bit disappointed with the fact that I only received one full sized product this month. This is probably one of my favourite things in this months box. I have been using it every time I wash my hair. It smells amazing!! it has such a sweet scent that makes you hair smell amazing. I dye my hair blonde and sometimes the ends of my hair get really dry, this overnight recovery has made my hair so much more mositurised and makes my hair so soft. I have never used a product like this before, I have always used products that you put in your hair when its damp but never dry. I was so excited to try this and now I am obsessed. All you do is rub it into your hair once it has dried and overnight it will moisturise your hair and keep your ends hydrated. It doesn’t leave your hands feeling tacky or sticky, most of the product goes into your hair so you aren’t wasting any. This product has made me feel so much better about the ends of my hair, and this is perfect if you are feeling like you need a little trim this is going to keep the ends of your hair feeling healthy. I love the whole concept of this product and love that it is different from anything I have used. When I finish this, I am DEFINITELY going to be buying some more. This isn’t normally the sort of product that I would normally reach for, but since receiving it I have been using it on my lips near enough every day. 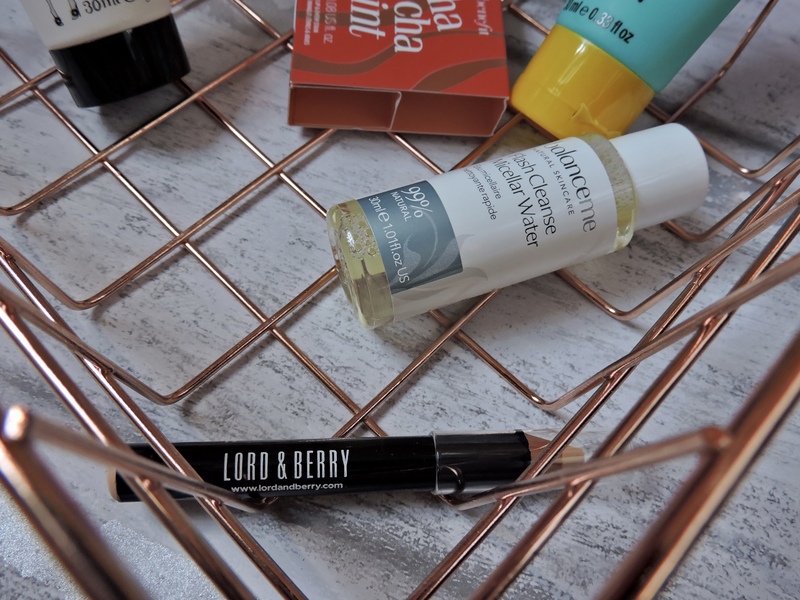 It creates a really nice natural lip colour and just adds some more colour to your lips. It looks like you have something on your lips, but it isn’t heavy or sticky it just looks natural. It stains your lips so it lasts for a while, but not too long where you are struggling to take it off at the end of the day. I used it as a cheek tint once and I didn’t like it, the product didn’t move at all and it was so hard to blend on my cheeks so I will only be using this for my lips. When I put it on my lips it is really buildable and I love that I can make it as subtle or as dark as I want. I really like the colour of it as it is a different shade that I wouldnt normally reach for. 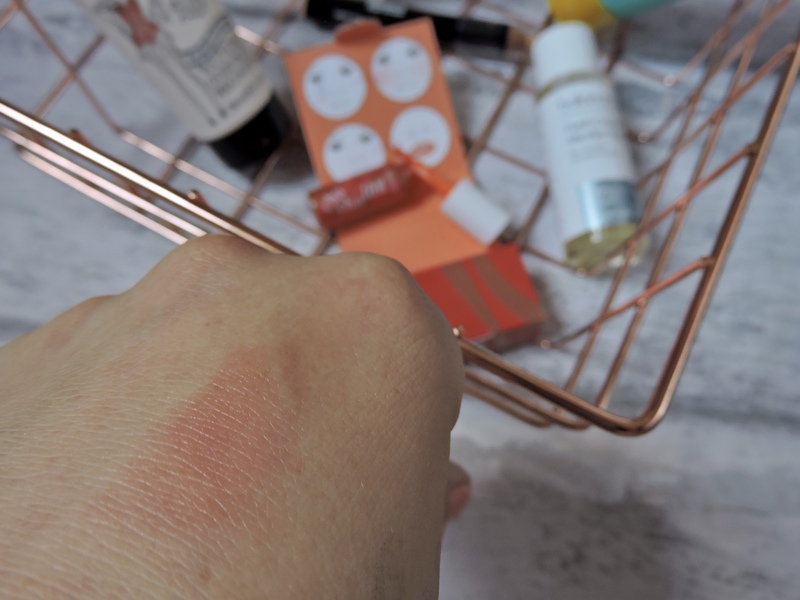 The product is really easy to apply, as you can see from the pictures above there is a little applicator to apply the product onto your lips. This makes it so much more easier to apply. Once I have applied it, I normally just blend and dab it out with my fingers. 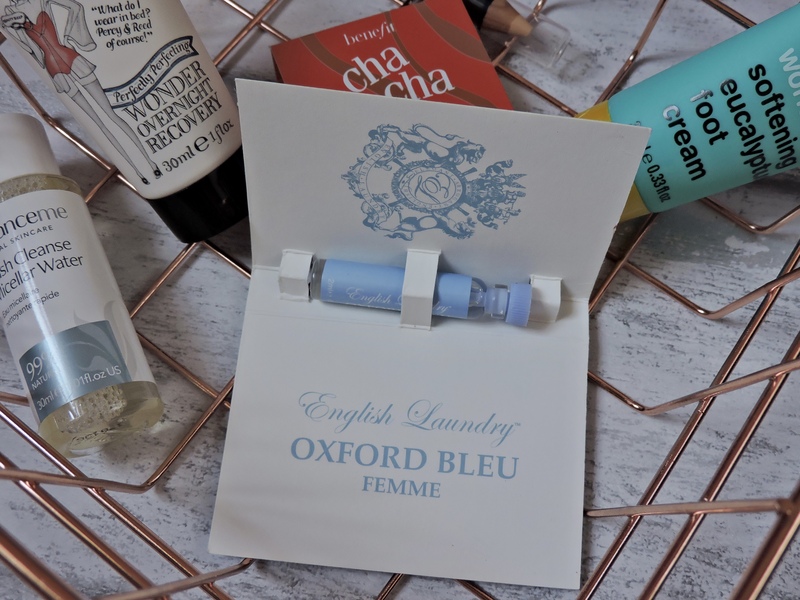 Even though this is a sample, it is so ideal for leaving in your handbag and also taking out with you on a night out. I have never heard of this brand before and I always love discovering new brands. Although this colour wasn’t the colour that I would use under my eyes, I have been using it to cover spots etc.. I don’t really use pencil concealers, I normally use the Collection lasting perfection one that is in a little tube. I have been enjoying using this as I feel old school with it. I thought the packaging was pretty simple, but I really like the Font of the brand titled on the side of the pencil. I like how on the bottom there is a little oval with the colour of the crayon so you can see the different colours. 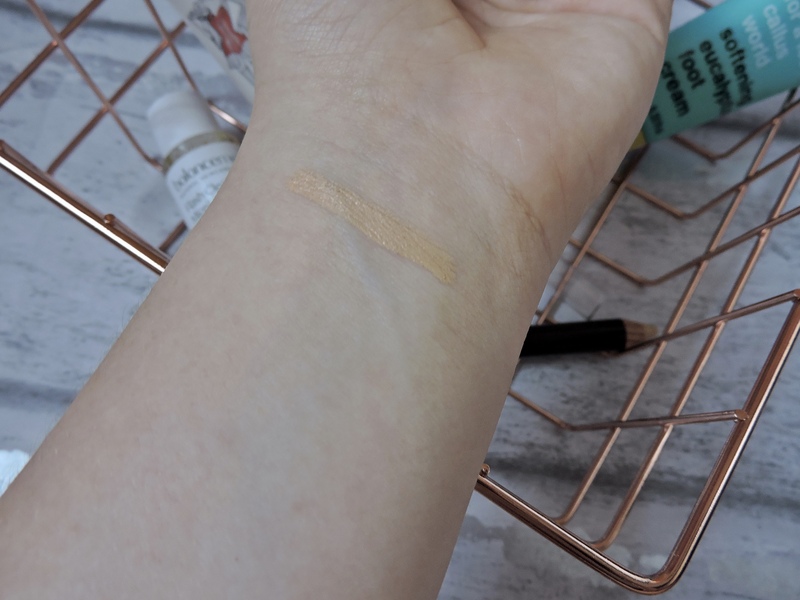 The formulation is really nice, it is really creamy and really blendable. I probably wouldn’t buy this as I am happy with my current one and wouldn’t substitute this for it, but it is a good back up for me. 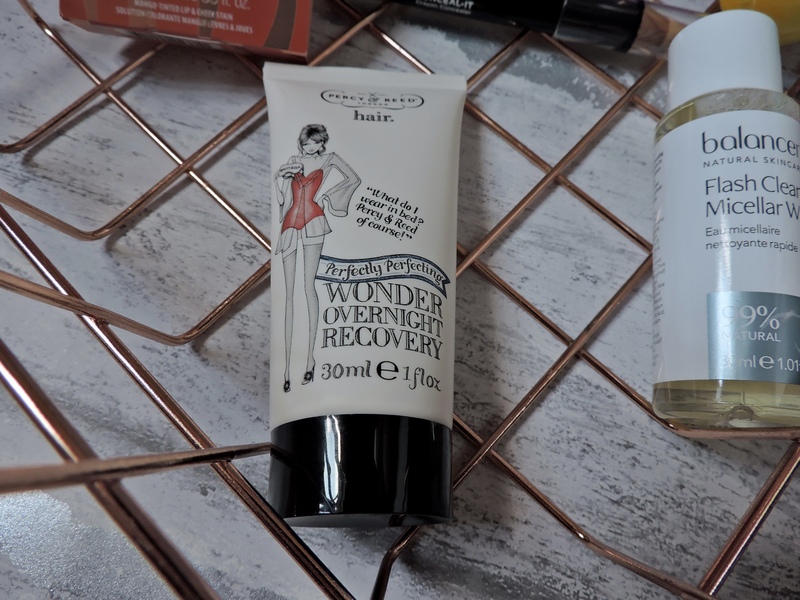 I haven’t reached for this concealer a lot as I am happy with my current one, but it is always a good back up. As you can see the formulation almost looks wet as it is so creamy. 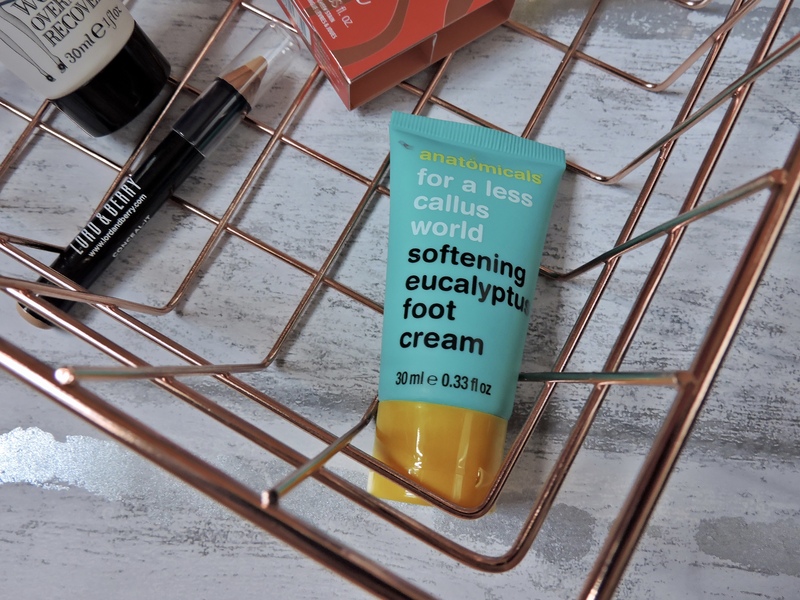 Moisturising my feet is something that I have made myself do more of as I think moisturisng your feet can be just as important as moisturising your hands. I always fail to do this, but since I received this I have more of an effort. This stuff smells great for a foot cream. I use this when I can before I go to bed and then I put fluffy socks on. It makes my feet so soft and hydrated. I don’t really get dry feet or anything, but keeping on top of it won’t harm anyone. The product sinks really quickly into the skin so your feet don’t feel really sticky and wet for ages. This is definitely the perfect product to massage into your feet after a hard day. If you are someone who suffers with dry skin on your feet then I would recommend this. It is such an affordable price aswell which I think is great. People are so crazy about micellar water and I am one of those people, therefore I was looking forward to try this. When I first used it the first thing I noticed was that it had a very distinctive smell and I didn’t like the scent at all. It says on the bottle that it is infused with camomile, but it doesnt smell like camomile to me. It smells like a mixture of raisens and oranges. It smells SO STRONG that I had to go over my face with a different miceller as it was boarer line giving me a headache. I did also notice that after I used it my face would tingle for a couple of seconds. I have used micellar waters a lot so I knew that this isnt supposed to happen, my face didnt look irritated from it though. 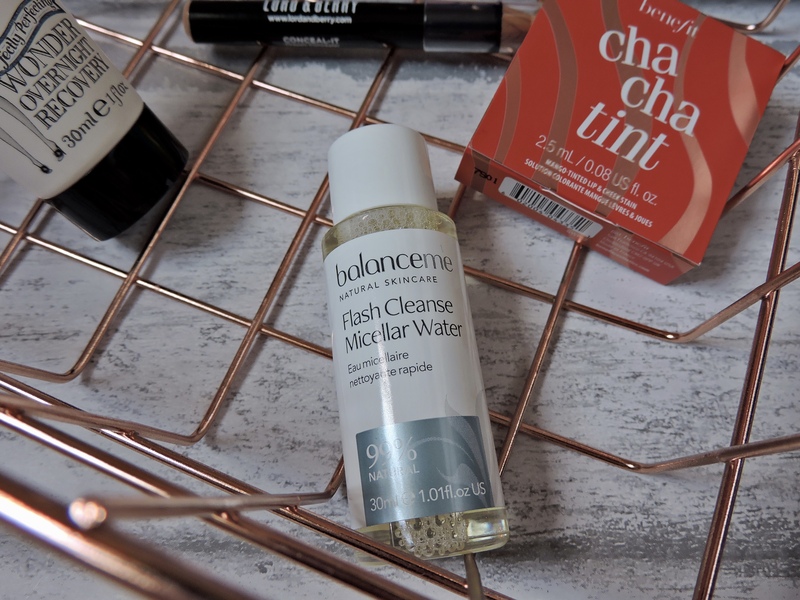 It took my makeup off really well, what felt like a quicker process then the other micellar water that I have been using. The water isn’t completely clear it is like a light yellow colour. I wouldn’t use this to take my makeup off over what I am currently using, so I might see if my mum wants this to be honest. I have never heard of this type of perfume before, but it smells amazing. It has such a lovely fresh scent that to be honest I didn’t thin I would like when I read the card it came with. It is a really feminine scent that honestly smells delicious. The bottle is in a cute tester bottle that is going to be good to keep in your bag while you are going out. 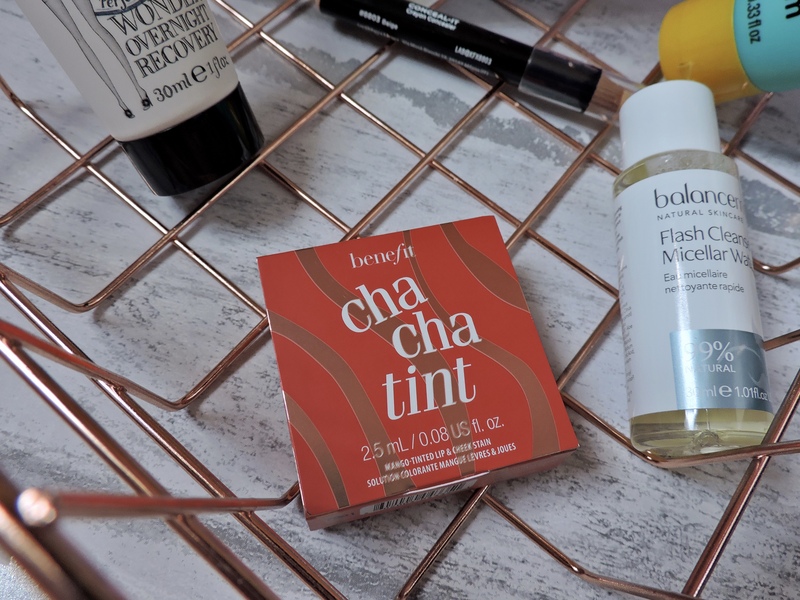 I loved all of the products that I received in this months box, there was such a wide range of products that I got. I have been using more than half of the products that I got. What products sound appealing to you? Love all the stuff you’ve received! Even the box itself looks lovely! Great post. 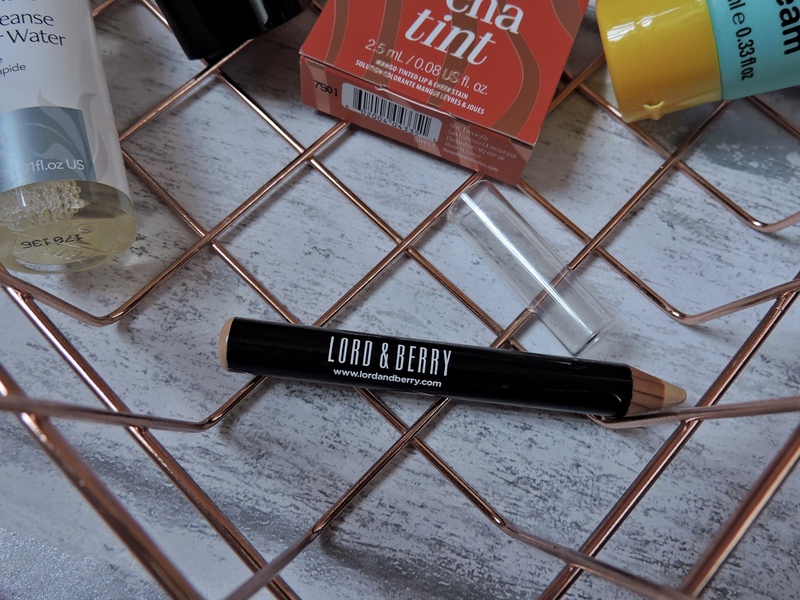 That Lord & Berry looks soo creamy for a pencil, I was definitely expecting something much dryer! If you want to try more from them, their lipsticks are amazing! 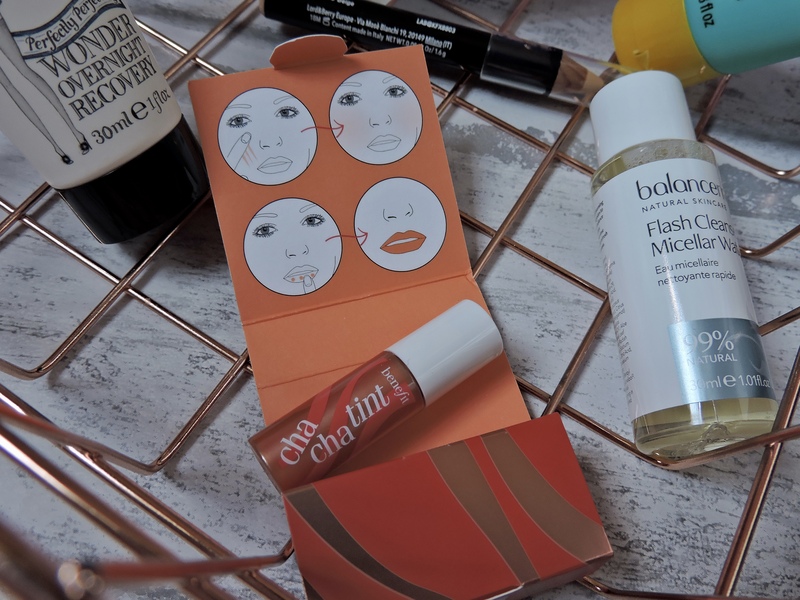 This months box looks like I’d use most of these products which is sometimes a rarity with subscription boxes. I love reading your reviews though! Do you find you like the majority of the products each month or purchase them again later? I love the design on the box! Subscription boxes are so fun! I love seeing what others get in theirs. It looks like you got some good products this month. I don’t have Birchbox, but I do have Ipsy. (I just made a post yesterday about what I received this month). I’ve contemplated signing up for Birchbox as well, but I think one monthly subscription is good for now. 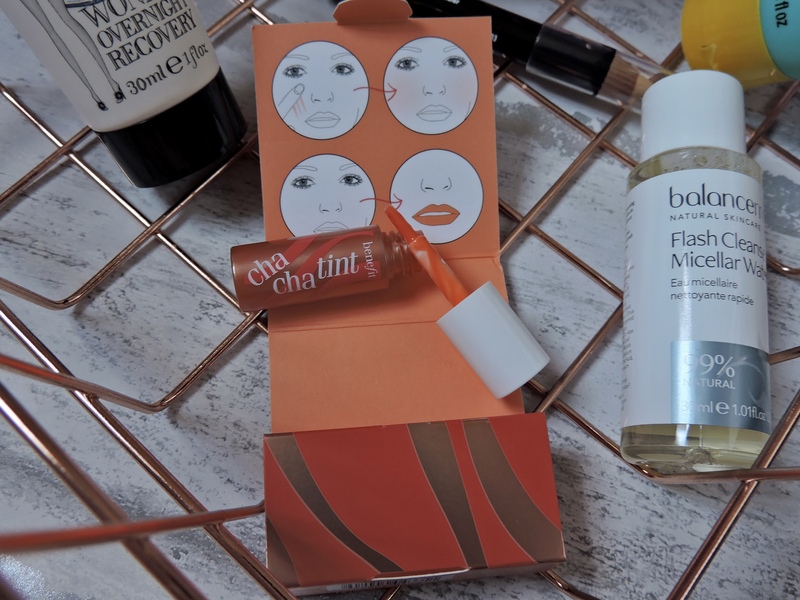 The box is so lovely and the products look great too. I would love to try the concealer pencil.